The ingenious 2 Red Hens toy nanny tote is a portable play mat and toy carry case in one convenient tote. With plenty of room for your child's favorite toys, the 2 Red Hens studio toy nanny tote has eight mesh pockets to keep things organized and a shoulder strap for easy carrying. Strap drop is 23 to 27". 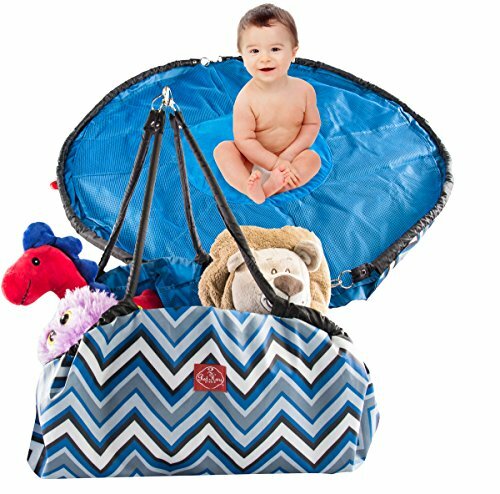 When its time to play, the toy nanny tote unhooks and spreads out to create a soft, clean play area 36" in diameter for baby anywhere you go. 100% polyester-BPA, PVC, and phthalate free. Wash in cold water and lay flat to dry. If you have any questions about this product by 2 Red Hens, contact us by completing and submitting the form below. If you are looking for a specif part number, please include it with your message. Baby Play Mat, Tumama Extra Soft Reversible XPE Playmat for Kids Infant Non Toxic, Waterproof, Ground Interactive Exercise Playmat, 78"x59"